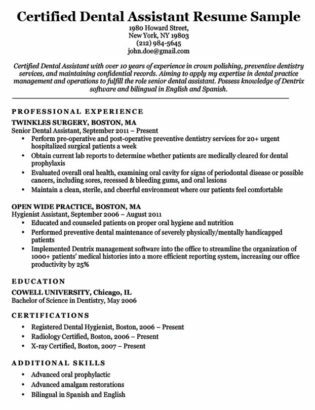 Writing a dental hygienist resume can be as painful as a root canal — but with the right tools, it isn’t so unnerving. Check out our dental hygienist resume sample and writing tips to get started. If you need some extra help, try out our free resume generator. The easy-to-use software will get you on the right track to an interview. Want to take a look at resumes for other industries? Browse our extensive library of resume samples. Need some extra style help? 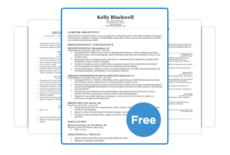 Check out our free, downloadable resume templates for some pointers. Ready to move on from crafting your resume? Take a look at our complete list of cover letter examples. Registered dental hygienist dedicated to delivering optimal care and providing high-caliber patient counseling. Motivated self-starter with over 4 years of experience in clinical settings. Strong interpersonal and organizational skills, recognized for building rapport with diverse populations. Though both are dental professionals, the dental hygienist and assistant roles differ significantly. Dental assistants generally support dentists by preparing equipment and providing chairside assistance. They also handle more office management tasks, such as filing patient paperwork and scheduling appointments. Dental hygienists, on the other hand, work independently with patients, cleaning and polishing teeth without supervision, and conducting more advanced procedures (e.g., taking and developing X-rays). While the scope of each position’s duties may vary by state (as we touch on more below), be sure not to confuse the two. The education requirements and qualifications for a dental hygienist and assistant are also different, and you certainly don’t want to over- or undersell yourself by using the wrong title. Did you end up on the wrong dental professional resume? 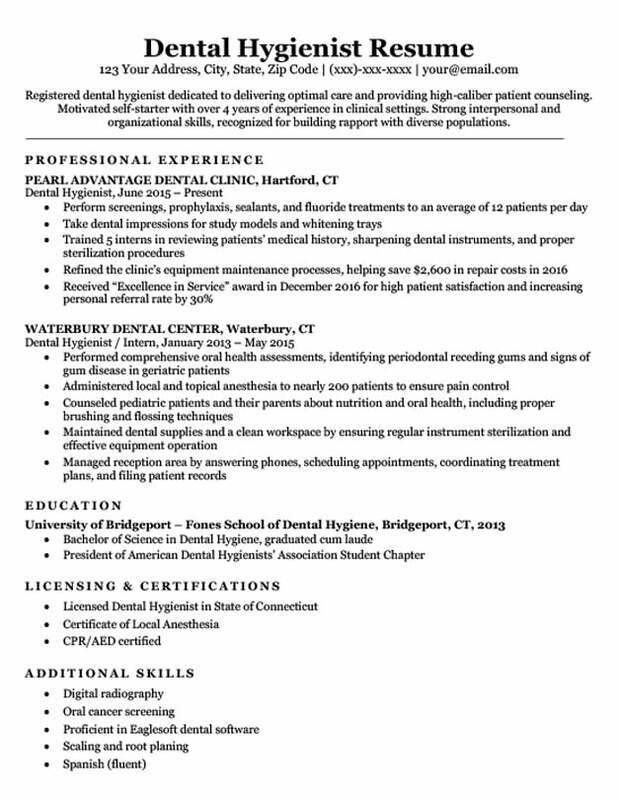 Check out our dental assistant resume sample for tips that may better suit your background! Individual state dental practice acts list different licensing requirements for dental hygienists across the U.S., whose scope of work and required dentist supervision can also vary significantly. For instance, some states do not allow dental hygienists to administer local anesthesia; others allow it so long as one is certified; and some allow it even without certification. In any case, it’s crucial to emphasize your licensing and certifications in a separate resume section. A licensing and certifications section is a must for a dental hygienist resume. Not all industries and occupations require this section, but it’s essential for dental hygienists — after all, it tells prospective employers that you meet your state’s dental board standards. If applicable, you can also add any advanced training programs that demonstrate more dental knowledge. Needless to say, not everyone enjoys getting a dental checkup. Teeth cleanings and oral exams strike fear and discomfort into the hearts of many, making it crucial for dental hygienists to be warm and personable. Successful dental practices thus look for candidates who demonstrate strong interpersonal skills, which can help in ensuring a clinic’s high patient retention rates. Check out how our sample candidate emphasizes their people skills by mentioning them in their resume objective and professional background. Making note of your past work with different groups (e.g., handicapped patients, non-native English speakers) may attract dental employers who have many clients of a particular demographic. These action verbs are far more descriptive than the common, passive phrase “responsible for.” By using more vivid language, your resume will make a greater impression on potential employers and get you one step closer to a job offer. Drill in these tips, and you’ll be well on your way to an interview! If you want extra help, try our free resume templates.